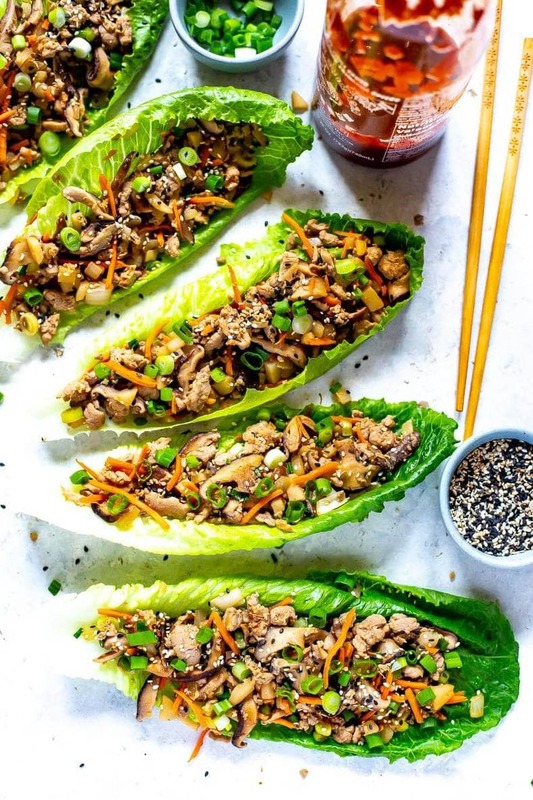 These PF Chang's Chicken Lettuce Wraps are a super easy copycat of the restaurant version – and they are also a healthy, low carb dinner idea made with ground chicken, mushrooms and water chestnuts! Looking for a healthy, low carb dinner option that's a perfect copycat of one of your restaurant faves? These PF Chang's Chicken Lettuce Wraps are gonna hit the spot! In fact, I'm so in love with chicken lettuce wraps in general that I've even made Mexican Chicken Lettuce Wraps and Sriracha Meatball Lettuce Wraps among a few other versions. You just can't go wrong this healthy dinner idea. If you're looking to get serious about meal prepping and make more delicious meals like these, you HAVE to sign up for my free 5-day challenge below! It's going to get you on the right path and give you the structure you need to meal prep like a pro! Most of the ingredients for these PF Chang's Lettuce Wraps can be found in your pantry believe it or not! You don't even need to whip up a special sauce because you will be flavouring the ground chicken mostly with sesame oil, onions, freshly minced garlic and gingeroot (though you can also use dried ginger). Shiitake mushrooms also add a ton of natural flavour so the emphasis here really is on the veggies. Add in some reduced sodium soy sauce and sriracha and you've basically got these chicken lettuce wraps all cooked up! Easy right? 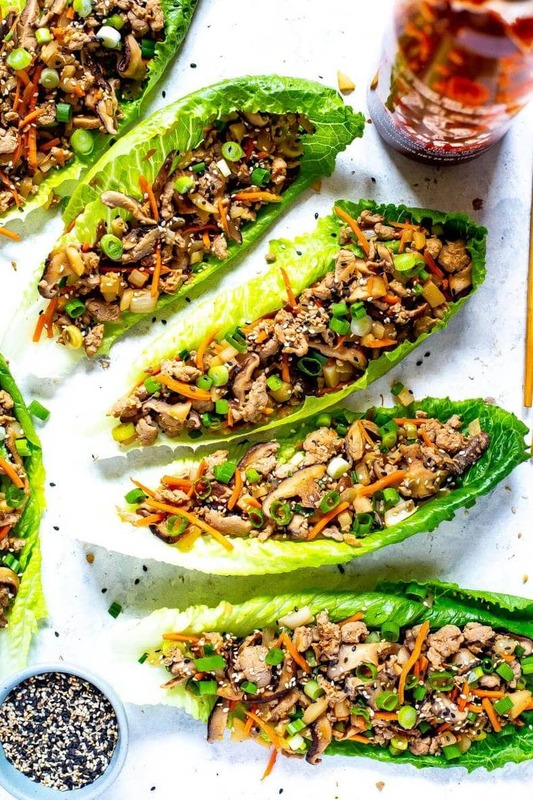 I liken these Asian chicken lettuce wraps almost to an open-faced potsticker or egg roll. The flavours are reminiscent of an egg roll filling but without any of the work of wrapping it all up in wonton wrappers. All you need are some lettuce leaves for the chicken filling and you're set! 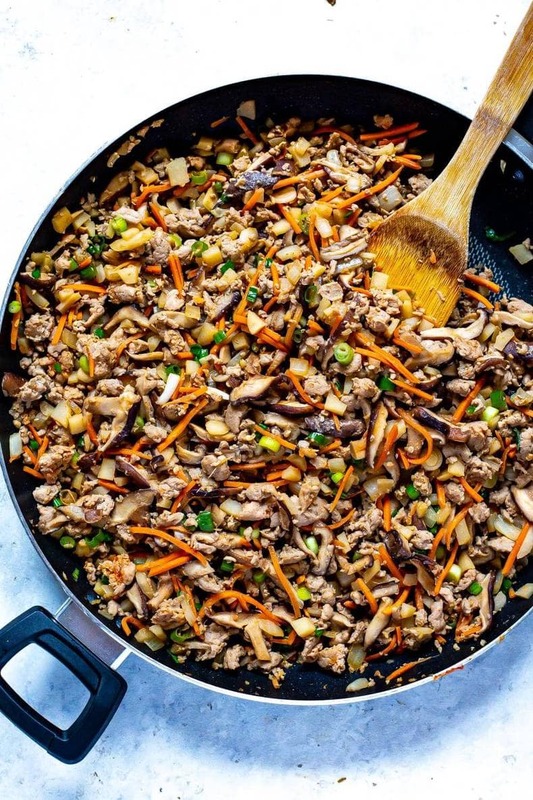 You'll basically be cooking the lettuce wrap filling all in one skillet so the amount of dishes you dirty up will be slim to none, and because you're using ground poultry you don't want to overcook it, leaving you with less than a 30-minute cooking time. You'll want to cook the mushrooms for 4-5 minutes until the juices release, then add the rest of your ingredients and cook another ten minutes. It just doesn't get any easier than that! Water chestnuts are an underrated ingredient that you usually find in stir fries and I don't know why I've wanted so long to cook with them again! 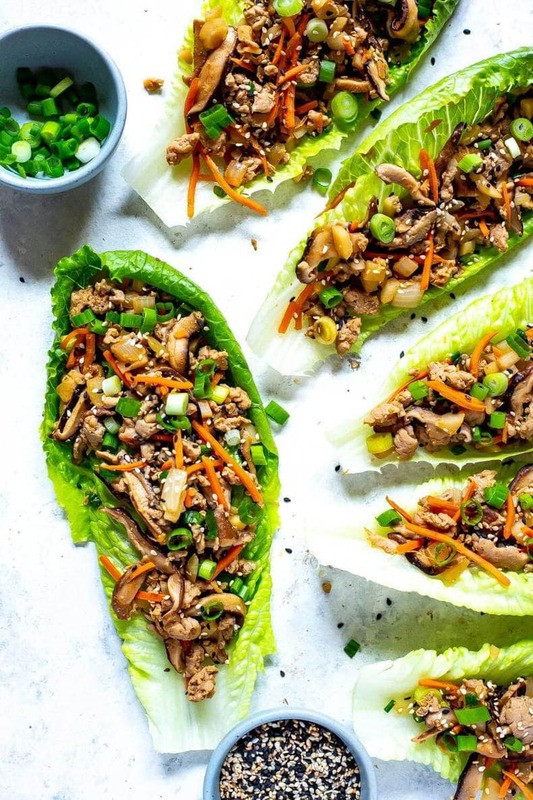 They add such a fun, crunchy texture to these PF Chang's Lettuce Wraps and help balance out the flavours and textures. I also like adding some thin-sliced green or red cabbage to the ground chicken mixture. It doesn't take long to cook and adds some extra nutrients and flavour too! 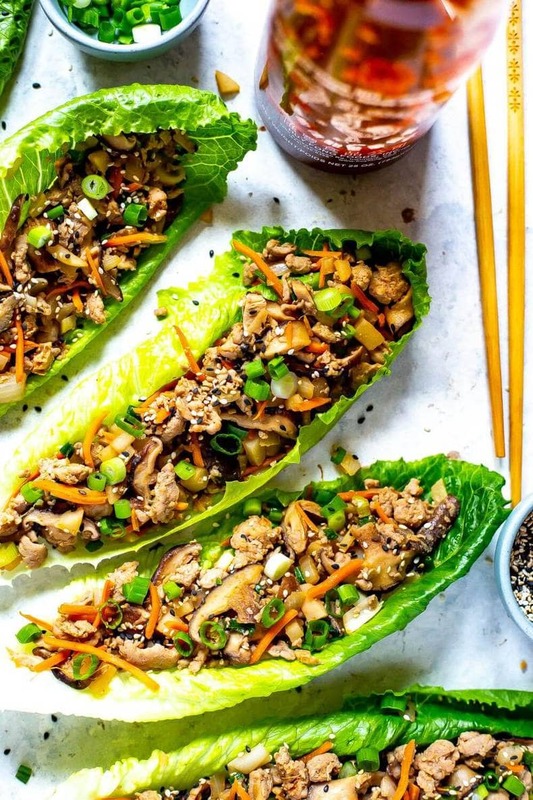 Finish off your Asian chicken lettuce wraps with a little sprinkle of extra green onions and sesame seeds (and maybe even some sriracha to boot) and you've got one healthy, delicious dinner idea! 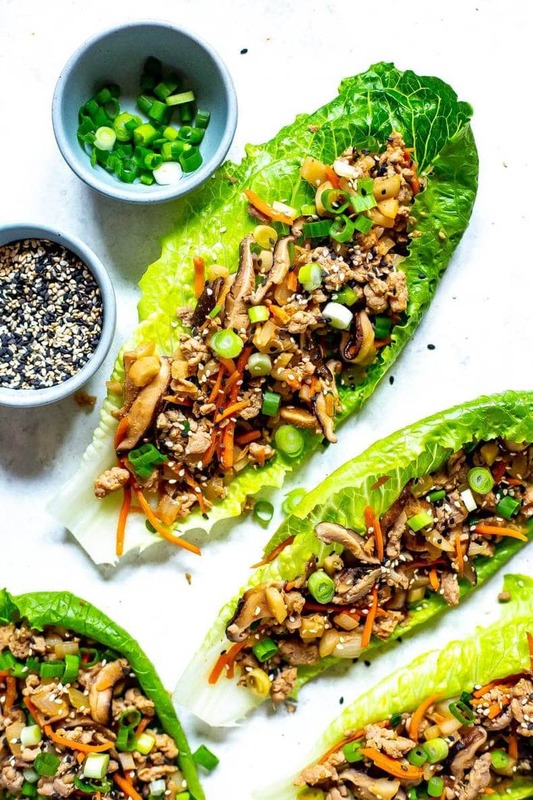 And these lettuce wraps are also perfect for meal prep! Pack them up in some glass bowls or just eat the filling alone like you would an egg roll bowl. 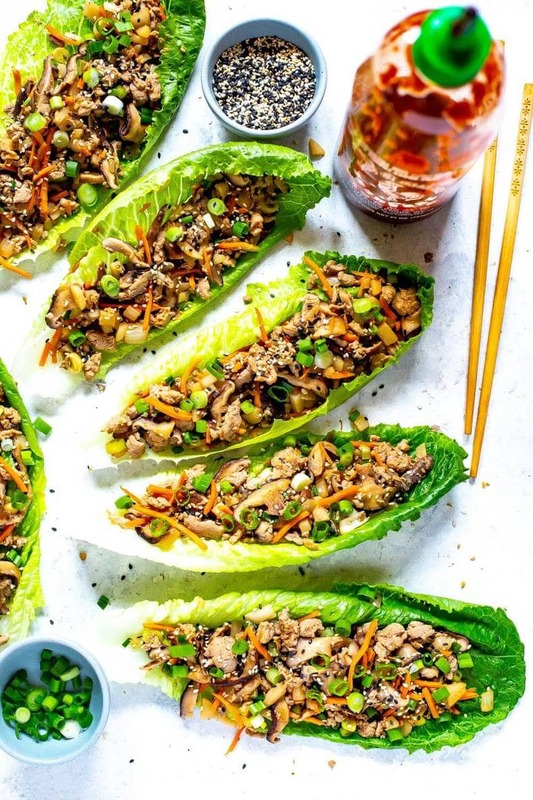 Next time you have a craving for restaurant food you'll remember these delicious copycat PF Chang's Chicken Lettuce Wraps – they're such a great way to enjoy your favourite appetizer made healthier! 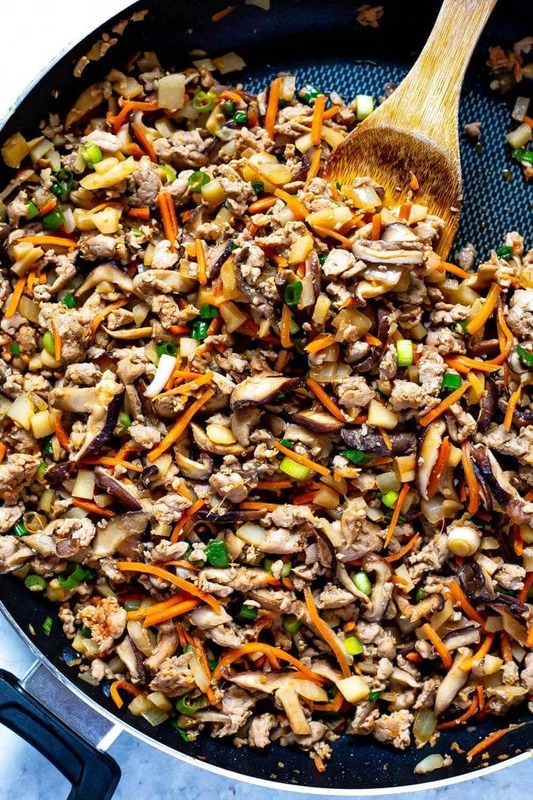 Will you be making these PF Chang's Chicken Lettuce Wraps? You're in for one delicious dinner that's perfect for keeping you on track with your healthy eating! Grab some glass meal prep bowls if you plan on packing these lettuce wraps up for lunch! And of course I get all my free-range ground chicken from Butcher Box! 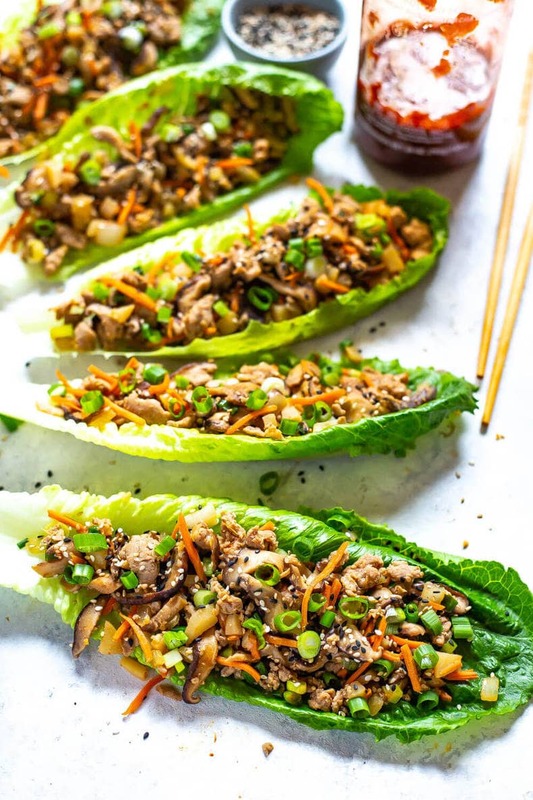 These PF Chang's Chicken Lettuce Wraps are a super easy copycat of the restaurant version - and they are also a healthy, low carb dinner idea made with ground chicken, mushrooms and water chestnuts! Heat sesame oil in a large frying pan over med-high heat. Add mushrooms and cook for 4-5 minutes until juices start to release, then add chicken and break up with a slotted spoon. Add onions, garlic, ginger, soy sauce, sriracha, water chestnuts and carrots, mixing all together and sauteing until chicken is fully cooked, about 8-10 minutes. Remove from heat and stir in green onions. Add chicken mixture to lettuce leaves then serve and enjoy! I see the nutritional values, but what is considered a serving size? If you divide the recipe in four, one of those is a serving. Unfortunately I can’t give out exact serving size amounts by measurement/weight.